Origins : Sikhism relies on Guru Nanak from the middle ages, but it should not to be confounded with modern SANT MAT or Radhasoami. Even Yogananda speaks in his first teaching-letter about Guru Nanak. The most important book of Sikhism is the "ADI GRANTH", which is nowadays the 'Guru'. The Adi Granth says, “Omkar Ved nirmaye”. ("Omkar(God) revealed Vedas , i.e. Omkar reveales the highest knowledge). The statement of guru Nanaks "Ek Onm Kar" ('there is only one god') is similar. For Guru Nanak was God Himself the Guru: 'TAT NIRAN~JAN JOT(I) SABAAYEE SOHN~ BHED NAA KOYE JEEO APARAN~PAR PAARBRAHAM PARMESAR NAANAK GUR MILIAA SOYE JEEO'. A citation of Guru Nanak : "The drunkenness through NAAM, o Nanak, never ends ", and in the Jap Ji 19: "The whole creation came only by NAAM and there is nothing which wouldn't start out of him ." Therefore the highest "Guru" or the Supreme Being is unborn, invisible but certainly immanent in all objects. Therefore the divine sat-plane is unreachable for the highest masters who "only" stand in the highest force of the plane under the SAT and are not inkarnations of the highest beeing. The hinduistic reformation movement "Radhasoami Satsang" (Unification with the master of the soul) was founded 1861 by Shiv Dayal Singh. Shiv Dayal Singh was very much influenced by Sikh-Guru Nanak. He taught about Sat-Nam and Anami. After Rai Saligram had become his disciple the teaching changed to the Radhasomai teachings and named their belief "Sant Mat" (Teaching of the Holy). The teachings about the "rulers of the inner planes" are different from Sikhism and the ADI GRANT. Typical are guruship and denying of the caste-system. In the book "Sarbhajan"(from Radhasoami Beas) stands in the last directions of Soamiji before He left the body : "My path is the path of Satnaam Anami, whereas Rhadasoami is the path of (Raj) Saligram. Let him go on with that." The mission of Raj Saligram (Hazur Maharaj) then flew into the branch of Radhasoami Agra which uses the long mantra (Jod niranjan... soham satnam). Therefore we find th ose scools which give a single "Naam"(Anami) and the scools who give the long "Jod......nam"(Agra, Beas) and their followers. 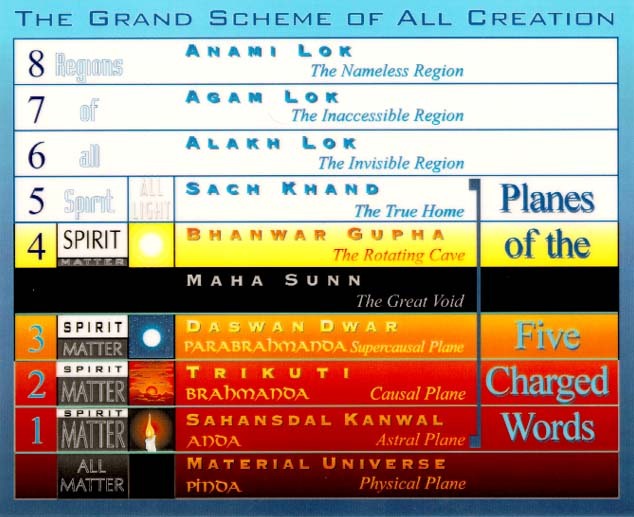 Depending on the teaching of the guru Radhasoami knows up to 18 planes of creation, similar to the worlds of Eckankar, whose first guru had left Kirpal Singh. Radhasoami sees the Logos of our planet and of the other planets and stars just on the higher mental planes. (Huzur-Info). It knows ONLY ONE GOD RADHASOAMI, who is the alleged personification of love, mercy and grace. The satgurus are HIS inkarnations. Therefore Radhasomai declines avatars (:" On their heads grows Watergrass", Kabir) and does not acknowledge the cosmic avatars ala Alice Bailey. Hinduism knows instead unifications like "Radha with Krishna" and "Jiva with Paramatma" as steps to enlightenment and mastership. now as S.O.S under his son Rajinder Singh, who studied in the USA. are today known partially very separatistic groups. A website of Prof. Lane, a very old member. 'Supreme Master' Miss Ching Hai teaches the Quan-Yin-Method which is practically the same as Surat Shabda of Sant Mat(same long Mantra : Jod nir....shoam sat nam), but she does not officially belong to Sant Mat. The teaching : The soul must pass several lower spheres with their rulers who want to capture the soul into their kingdoms, before it reaches Radhasoami, the highest Lord (-> but in reality it can only reach the Ishvara - at most the Sadashiva-consiousness. It is not allowed to reach the highest ONE of our planet). Such rulers would have much to do - but there are dangerous black masters and Rudra-masters at the treshold to the divine. Only after the initiation of a living master, who gives a long mantra "Jod-.-.-.so ham.-.sat-nam", and by a meditation on the "inner SOUND and LIGHT", closing the ears with the thumbs and concentrating on "inner light and sound", the highest goal, the UNITY with RADHOSOAMI, can be finally be reached (sometimes Naam is mentioned). Devotion to the guru and long meditations and introspection(diary) are essential parts of this lifestyle. 1. In the astral plane (the first plane) the sound : Ringing of a bell. 2. In the Causal plane the sound (the second plane) : Beating the big drums. 5. In the Sat Lok or Sach Khand (5th plane) the sound : The Bagpipe. KAL IS WATCHING YOU ! Satpurush became angry about that and created the lower planes out of him (where erverything is foreordained and predetermined..... so even the fall of niranjan ?). (But, as Guru Huzur admitted, hiddenly Radhasoami works in all things). But why should KAL have wanted his own loka as he was alone with Radhasoami ? This strange story of KAL is similar to the fall of Lucifer Satanas of Jacob Lorber, who was thrown down into the lower worlds after an extreme examination by the lord for ''true godlove''. Only the Jainism knows a similar cosmic Lokapurusha. Essential in the teachings of Radhasoami and "Surat shabd yoga" is the necessity of a living human master who is competent to initiate disciples into the practice and technique of listening to the inner sound (bhajan), contemplating the inner light (dhyan) and the mystic death (dying while living). [*NOTE: Charan Singh, Die To Live (Beas: Radha Soami Satsang Beas, 1979)]. The problem of bhajan are the sounds which can be heared - if at all. The "soultravel" trough the planes as described in the book of Mr. Mark Juergensmeyer is the symbolic travel of a very developed person who stands in the power of the sounds and of the light and therefore he has experiences on all planes. But the normal disciple heares not much, and sounds of all sorts are on all lower planes. Therefore many other Nada-scools use a Bija-Mantra like OM, AUM and NAAM together with the Bhajan, and i think personally that Bhajan as taught from Beas without a mantra is a waste of time and can mislead in meditation. I do not want to say that there were no Satgurus in the past (perhaps this is the movement with the majority of the known satgurus), who incarnated from their high position and helped each other reach the lost goal again. But for the common disciple these exercises are a bit weak, and from my sight only the hope for a better incarnation within this tradition maybe a real reason to stay here. These gurus cannot give more protection(gurumukh) than other masters because they stand under the control of the same highest divine. In our time Master Kirpal Singh went from BEAS to New Delhi and made the Surat Shabda Yoga very popular for his lifetime. Kirpal Singh was part of this Radhasoami movement, as he was personally initiated by Sawan Singh (1858-1948), the former 'gaddi nasheen' of Radha Soami Satsang Beas at Dera Baba Jaimal Singh in the Punjab. He wrote the excellent book "NAAM - the word" and some other books. In this book he praises the NAAM-SHABDA as the best path, similar to a statement in hinduism which says that Shabda is the best method for the Kali-Yuga. But NAAM is also a Bija-Mantram of Swami Narayana, and this book does not mention any "rulers of the planes". It was written to prove that Shabda leads to the highest goal, but it is mostly a great collection of citates of saints of all religions who speak about the inner sounds, but it is not a proof that the fivefolded mantram of Sant Mat leads to this highest force or to this goal. Of course Enlightenment does not depend upon errors in a beleife, and therefore many incarnated masters soon received their past enlightenment with simple methods or with the help of their personal master..
As mentioned Kirpal speaks about NAAM, which is the Bija-Mantram of "Sri Swami NARAYANA", but he taught the long mantram ! The modern techniques of Sant Mat use a fivefolded mantram "Jod......soham-satnam" and a meditation on "sound" and "light". The teaching is that the student passes ALL planes until he reaches the true original Nama or Shabda. Kirpal Singh admits in his book "Naam" that "only single chosen disciples reach moksha". But guru Kirpal had disciples like guru Thakar Singh. Despite from this it makes a doubtful impression to tell the disciples that the "Golden Age" has started. Some gurus leave the impression that the disciple develops up to the highest plane. "I am a sacrifice to those who serve the Gurmukh with love; He is free himself, he frees his family, and the whole world." Here he is not speaking of the Guru but the Gurmukh; and those who serve the Gurmukh sincerely with love not only will receive salvation for themselves, but also for their relatives and friends, for the Gurmukh comes to give salvation to the whole world." "Gurmukh frees millions with a spark of Naam." His resources are everlasting, but those people who have gained a little and start distributing it everywhere only end up with regrets. They are doomed themselves and so are those who follow them." The full SHABDA is first heared at higher stages of the path and disappers finally (see also -> Blavatsky : The vioce of silence). So the existence of such "rulers of the planes" must be doubted, alike the meaning of the five names : "Jod nir......so ham sat nam". JOD (Jot) is the first flame of creation in the kabbalah, "Jot" means "Divine or Highest"
It seems that this long mantram does not call some strange rulers of the planes but the "highest atmic Niranjan" whom Satpurusha had pushed into his own world, and about further forces in the atmic and buddhic plane. The Radhasoami, the master of the soul, is so similar to the hinduistic pair Radha-Krishna, so that Radha would have the meaning of the spiritual soul and not of the primary active divine force. Therefore remain doubts that modern Sant Mat and Radhasoami understand their own traditional teachings. The consciousness of the lower planes is much too limited for a universal ruler of these planes. Such a ruler would have much to do watching the billions of souls and universes(even if it were only a planetary ruler). The human soul cannot unite with the highest lord because those energies are much too high. The soul cannot pass the AGAMA-plane (Agama means : no access). The master must develop a higher body than the soul to enter these planes. Such divine developement is first for a master of step 20 of the Universal Path. The cosmic vision of the highest lord is first for a master of step 21 of the Universal Path. The problem in Sant Mat is that the disciple does not understand that Sabda develops and transforms all bodies (Transfiguration) as a means of developement and that he does not just have to rise up to the highest planes. His hope is that the master does the rest comparable to Eckankar. Master Kirpal admitted that the VAK of an Initiation into the 5 names through a true master is necessary for spiritual progress. So the value of an initiation by a normal disciple of a master must be doubted. It is not sure who is the official Sant-Mat-Master at the moment. So You must use your reason to decide what it is all about ! Many years ago i found an email in which "Michael Martin" said that the Guru in Beas had nominated him as the guru for the west, but how can someone be a guru who is not a master of step 20 of the Universal Path, and guru Gurinder in Beas is eventually not a master either! Very generally said it is of course still much better to practice lifelong a weak meditation technique or a comparable exercise and so avoid that the soul sinks after death into the darkness, about which the old greek mystic said: "Better to live as a beggar on earth than as a king in the realm of the shadows".